Our Altered Landscape: Where do we Stand? My take on Our Altered Landscape is a conversation among three different artists, from three different perspectives, about the human hand evident at every level of our modern environment. While I do not believe we have to share a single, unified vision of our environment, the installation does have to hang together, literally and figuratively. In other words, where is the common ground? In my mind, Our Altered Landscape is an invitation to stroll through a modern forest, where groves of birches open up on vistas captured so beautifully in Bonnie’s urban landscape paintings. What Bonnie does so well is imbue everyday urban environments with the drama and reverence of Hudson River School landscapes. The view on Lankersheim during rush hour is as dramatic as Niagara Falls. 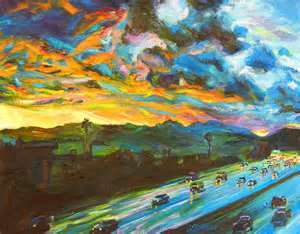 All the passion, fire, and fierceness of our altered landscape are already there. No tornado required. Ruth’s exquisitely detailed jeweled bugs and other small creatures inhabit the forest. Her masterful use of precious materials and meticulous workmanship lend a sense of reverence, fascination and awe to often reviled creatures…the creepy crawlies. We have to find a way to integrate jewelry cases in the landscape that give viewers the opportunity to see them up close—perhaps even with magnifying glasses. Like any great landscape, the winding path through the forest must afford not only sweeping views of urban skyscapes, but places to stop, observe, and marvel at the meticulous detail of these tiny human-animal hybrids. Both views have their WOW factor; I want to create an environment where a person passing through can fully appreciate both. The vanishing forest is the visual link between the micro and macro views. (Maybe three) clusters of (maybe five) birch trees that move from the literal to the abstract, from the substantial to the insubstantial. If all goes as planned, the latter incarnations will seem to defy gravity and float–fragile and ghost-like before they disappear completely into the painted landscape. I have toyed with the idea of resurrecting the trees as 3-D windmills, but I think this might even work better as a painting…or one windmill fading into a painting. The trees are reconstituted primarily from post-production tree products—paper and perhaps cork—along with chicken wire and other recycled materials. The stark black and white pattern on a birch is very skeletal, which relates nicely with the skeletons on Ruth’s Frankencreatures as well as to the black and white pattern of the scrimshaw. 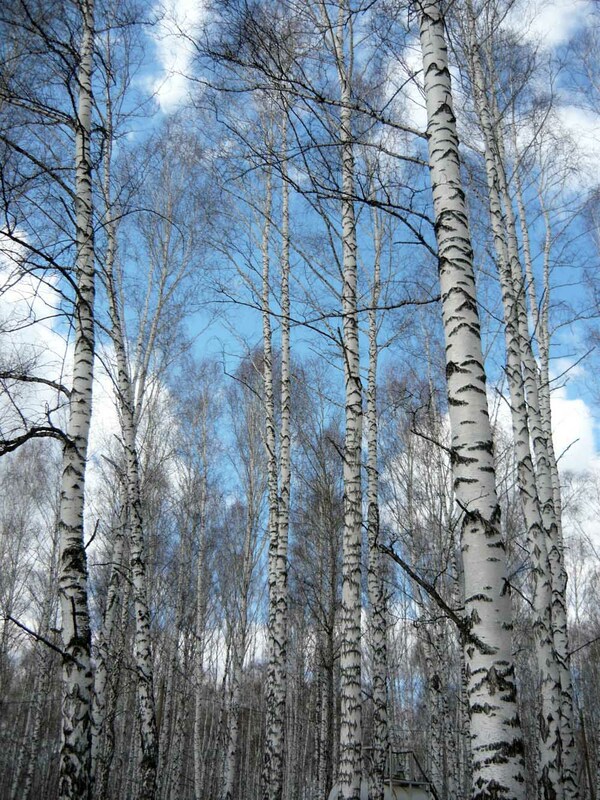 The slender vertical structure of birch trees has a very modern feel that relates nicely to Bonnie’s urban landscapes, which often include telephone poles and tall buildings. (What is a telephone pole, but a human-altered tree?) From a color standpoint, the black and white complements rather than competes with Bonnie’s bright landscapes. And, if I decide to go this route, a wind farm has the visual impact of a man-made birch forest. Finally, I can’t resist a visual pun–what better tree to construct from paper than a paperbark birch? We can always noodle with the fine points, but if this is not the direction we want to go in as a group, than we need to come up with something equally compelling…something that takes into account all of our viewpoints and hangs together as a concept.